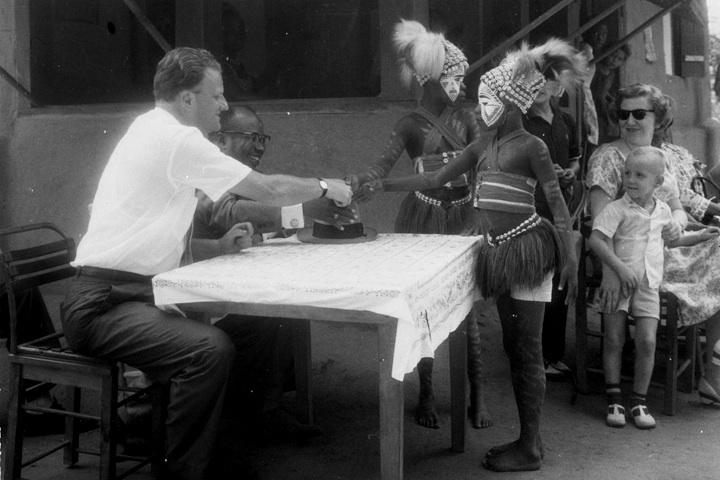 When I went to Liberia for the first time in 2007, I was not aware of my grandfather’s 1960 visit. It was not until after I arrived, I heard from a few locals about his time there. Many of them were very young when he was there, but they still had faint memories. Later that summer, I had time to sit with just my grandfather and tell him about my stay in Liberia. I intended to tell him all the details about my visit, but after awhile I realized he was doing all the talking. I remember sitting in his bedroom absolutely amazed at the vivid details he remembered. I sat and thought about the three generations the Lord has allowed to do His work in Liberia. Here is an excerpt from my grandfather’s autobiography, recalling his time in Liberia. Liberia, a democracy founded by freed American slaves in the early nineteenth century, was our first stop in Africa on January 19. As we landed, I wondered if it might be the last stop I would ever make. One of the plane’s four motors was spurting dark smoke. With sirens wailing, airport fire engines raced toward us. The combustion, I was happy to see, subsided before we reached the terminal. Vice President William R. Tolbert met us. A noted Baptist leader, he stopped at a small church on the fifty-mile drive into Monrovia. We had a brief prayer session there, sang a hymn, and recited the Twenty-third Psalm. Liberia’s president, William V. S. Tubman, was also a professing Christian, a Methodist; so it was not too surprising that our Liberian visit was the first ever that was government-sponsored rather than church-sponsored. We were housed in the government’s official guest house, and we were received by the president in the gleaming-white executive mansion. He expressed his hope that his people’s souls would be refreshed through the ministry of our meetings. Dr. Tolbert accompanied me everywhere, even presiding at our meetings in Monrovia’s Antoinette Tubman Stadium. My associate Howard Jones had already started the Crusade when we arrived. He and his wife, Wanda, were establishing a home in Monrovia. That would enable him to preach regularly on the powerful new Sudan Interior Mission radio station ELWA in Monrovia and to conduct evangelistic crusades all over Africa. The radio station was located on a beautiful beach; fronting it were some lovely missionary homes and a school for children. In the week preceding our arrival, Howard preached to large audiences. I preached the final two nights of the Crusade, with many thousands in attendance, resulting in 1,000 inquirers. It was an encouraging start to our African journey. President Tubman invested me, while in the country, as a Grand Commander of the Humane Order of African Redemption, the nation’s second-highest honor. The title commander was misapplied, I was sure, but the words humane and redemption meant a great deal to me, in view of my pursuit of God’s calling for my life. I knew that Africa could move in any of several directions—Communist, Islamic, animistic, or Christian—and I was there to promote the last. WHAT DID WE LEARN FROM OUR FIRST VISIT TO THE AFRICAN CONTINENT? For one thing, I came away with an overwhelming impression that God was at work in Africa and that, with the movement for independence sweeping across the continent, conditions were ripe for an unparalleled spiritual awakening. At the same time, I also learned firsthand that the struggle for Africa’s soul was not over. I knew that Africa could be plunged into spiritual warfare as well as social chaos, with animistic and tribal ways clashing with everything from Islam to Western consumerism. At the same time, I left Africa with a prayer of deep gratitude for the faith and sacrifice of those who had gone before us, bringing the light of the Gospel to one of the world’s largest continents. We were only following a trail others had blazed. When my dad gets up on stage in Monrovia it will be more than fifty years since my grandfather first visited this West-African country. I am sure it is a lot different from when he was there. Times have changed and Liberia has changed, but there is one thing that hasn’t changed, and that is the Gospel of Christ. Please be praying for my Dad and his team as they prepare for the Liberia Festival in late March. And if you want to follow me on my trip to Liberia please follow on Twitter: CissieGLynch and my mobile blog.